BeatTool is promoted as an application which can add useful elements supposedly necessary for enhancing your web browsing. The application is meant to provide special offers, coupons, help you compare prices and review websites. It is also disclosed that additional features could be enabled after the installation of the program. Furthermore, it is indicated that the content related to the application can include online advertisements. This is the information you might be familiar with if you have had the chance to think about the installation of the browser extension. 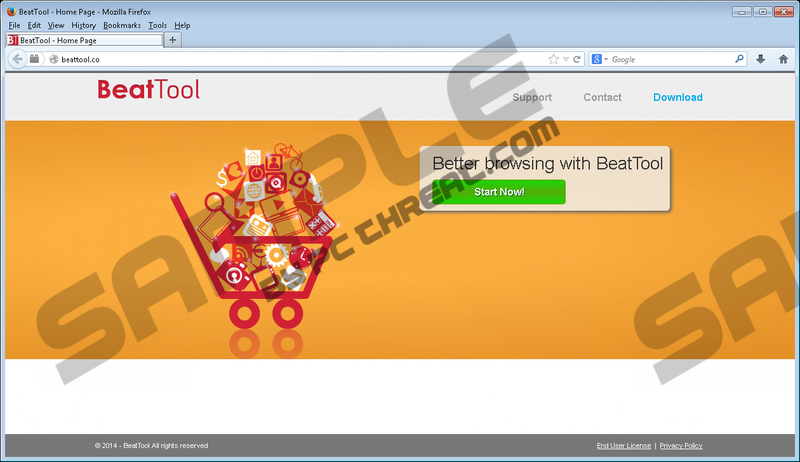 Unfortunately, most computer users remove BeatTool because it enters the operating system without much authorization. SuperWeb LLC is the developer of BeatTool, and this company is well known for such seemingly inactive applications as Rock Turner, Blarble or Crimsolite. Browser extensions presented by the company are not available from the web pages representing them (e.g., beattool.co); however, they often travel bundled with other software. Unfortunately, in some cases the suspicious browser plugins could be introduced alongside unreliable applications which may require immediate removal. If you have discovered the add-on running on the browsers without your notice, it is possible that other unauthorized applications are running as well. We recommend that you delete all suspicious, potentially intrusive programs from the PC. As mentioned before, BeatTool is created to serve various offers, coupons and saving deals. Note that the program is supported by third parties and they can serve online advertisements as well. In some cases, the suspicious ads might become more notable than the offers themselves, and this is quite irritating. All in all, whether you click on adverts, pop-up coupons or sponsored search results, it is most likely that you will be routed to third party sites. You could escape serious virtual risks if you interact with the presented content with caution. If you are not careful, it is possible that you could accidentally install unreliable, maybe even malicious software. Make sure you avoid this outcome. Those who are tired of the suspicious advertisements and pop-up deals which bring no benefit should delete BeatTool from the PC without further hesitation. The application travels bundled with suspicious software because it is not available from its own download page. This and the fact that the program is sponsored by third parties indicate that getting BeatTool removed is the best solution. Install automatic malware removal software or use the instructions below to delete the undesirable application. Now right-click on the screen and click All apps at the bottom of the page. Navigate to the Task Bar and click the Start menu icon (on the left). Locate and right-click the undesirable application. Select Uninstall to delete it from the operating system and the browsers. Quick & tested solution for BeatTool removal.